I recently posted this on our Twitter and Facebook pages. It is a delicious, savory combination that is great served with potatoes, cranberry sauce, and veggie gravy- or by itself! I make it in a traditional pie crust, but it’s delicious in any shape! It’s also easily made gluten-free by using a pre-made GF crust (Whole Foods has a great one in the frozen section). 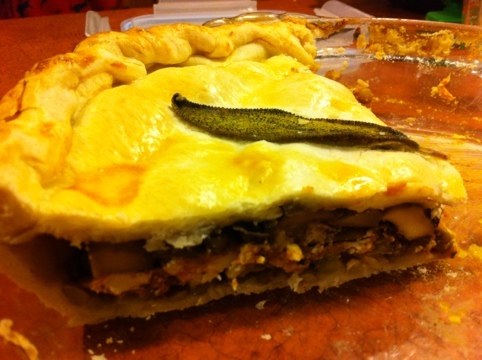 This entry was posted in Dinner, Gluten-Free, Vegetarian and tagged dinner, holiday, pot pie, vegetarian. Bookmark the permalink. Enter your email address to subscribe to Cookasaurus and receive notifications of new posts by email.